The politics of fuel ignited the downfall of President Goodluck Ebele Jonathan. The politics of fuel will ultimately ignite the success or failure of the second coming of General Muhammadu Buhari (rtd). Perhaps the defeat of Jonathan in the March 28, 2015 presidential election has continued to appear like a weird dream, especially to those familiar with his goodwill, but the murky images become clear once the politics of fuel pops up. The burning issue inflamed when Jonathan tinkered with a national oil subsidy program in the spring of 2012. The fear of increase in pump prices sparked public outcry and mass protests. This situation not only paralyzed the economy, it also helped to expose massive corruption in the subsidy scheme. Even worse, it effortlessly ruptured the balloon of public trust initially inflated by a cocktail of constant promises and the myth of a legendary luck. The president later restored some aspects of the subsidy quite alright, but the damage was already done. Although Jonathan has become its major casualty, the fuel problem actually predated his presidency. Celebrated as one of the leading producers of crude oil in the global market, Nigeria accounts for about 2 million barrels per day, most of which is exported to foreign countries. The Nigerian National Petroleum Corporation (NNPC) allocates the balance to its consortium of four refineries with a combined name plate capacity of 445, 000 barrels per day. The perpetual problem is that these local refineries have hardly exceeded 20 percent of their capacity for over two decades. This failure is commonly attributed to lack of maintenance. Yet, whenever the refinery plants are repaired, which is often, they are known to ironically break down as soon as the expatriate engineers board flights back to their native lands. This seemingly act of sabotage has led to deficit in supply as well as overdependence on importation of refined products. According to NNPC, “In order to meet the deficit in supply, Nigeria currently spends between $12 and $15 billion annually” through imports. This mire has continued to stoke a severe drain on the national economy and untold hardship on the masses. 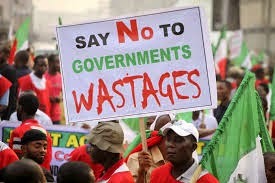 President Jonathan made efforts to address the problem through both public and private sectors. Among them is an agreement entered into by his government in 2010 with China State Construction Engineering Corporation to build three new refineries and petrochemical complex “under a $28.5 billion provisional deal.” Named Greenfield Refineries, the project was expected to “add some 750,000 barrels per day capacity to Nigeria ’s refining infrastructure and position NNPC to engage profitably in the international trading of refined petroleum products.” The then Managing Director of NNPC, Andrew Yakubu, would make world news in 2013 at the Offshore Technology Conference in Houston when he revealed that the budget for the Greenfield initiative was revised to $51.8 billion but with its capacity downsized to 400,000 barrels per day. Nigeria ’s Trade Ministry was not left behind. The ministry signed a $4.5 billion Memorandum of Understanding with US-based Vulcan Petroleum in 2012 to set up six new modular units, capable of refining 180,000 barrels of crude per day. The turn-key for two of those plants was slated within one year from the time of the initiative in 2012. Regrettably, apart from the good news flared upon official announcement, these projects have remained a pigment of a venal imagination. The common excuse is that NNPC could not source out the funds to build refineries. Yet, the oil giant has been pumping out an average of over $7 billion in fuel subsidy per annum, a bulk of which is siphoned to private bank accounts through crude political cronyism. In line with its deregulation policy, the Federal Government had granted refining licenses to the private sector but this program has not seen the desired success. Potential investors, including the banks, fear that a combination of government bureaucracy and the prevalent fuel subsidy scheme would make it virtually impossible to recoup costs without tending to market-determined prices. While some investors defied the odds and embarked on building private refineries, none of the plants has come on stream. One of the earliest private projects is the $660 million Orient Petroleum Refinery (OPR) in Anambra State . Being constructed by a US-based firm, the OPR has an original plan to produce 55,000 barrels of refined products per day. Though this refinery was declared open by President Jonathan in the wake of the 2012 fuel crisis, any thought of production has been a vain hope. The true position is that the project is undercapitalized and different efforts for the desired federal assistance fell on the deaf ears. The most ambitious of these private initiatives yet is the Dangote Oil Refinery and Petrochemicals estimated to cost $9 billion. The oil facility has a completion date of 2018, and billed to refine about 500,000 barrels of oil per day. Engineers India Ltd is contracted to provide procurement, engineering, and construction management of the refinery. A review of the above projects, both public and private, reveals mind-bugling disparities in cost schedules. Interestingly, it also shows that, similar to Nigeria ’s existing refineries, the contracts for the proposed plants were signed with foreign companies. The later pointer is loaded and serves an important purpose later in the analysis. Politically, the above NRSTF recommendation is very deductive, striking all the right cords. Publicly, the languages are politically correct, especially with respect to the extant local content laws. But practically, the report enveloped a theme it did not want the general public to know. The bitter truth is that, in view of the fact that Nigerians have not been effective in operating or managing the state refineries, the Presidential Task Force actually sought for the expatriates over local groups. Besides, it does not take a rocket scientist to discern that some unscrupulous elements within the refineries connive with fuel importers or backhand beneficiaries of the fuel subsidies to keep the oil plants perpetually comatose. By all indications, the endemic fuel problem has never been the inability to identify solutions or craft profound policies with attendant analysis. It is the lack of the political will to implement existing policies in clear and accountable manner. The objective fact is that effective implementation has been resisted because it is seen as a proxy attack on crony capitalism. Simply put, Muhammadu Buhari has his work cut out for him. The president-elect should resist the temptations of the politics of fuel staring at Nigeria ’s future. It is time to capitalize on various strategic policy recommendations already in place but direly waiting for prudent implementation. This sense of urgency has become necessary considering that a prospect for the actualization of the P5+1 nuclear agreement with Iran and consequent re-entry of the Arab country into the oil market will further plunge oil prices. In short, Nigeria can no longer afford a palpable level of fuel subsidy under the current economic outlook, and must explore immediate solutions. The second recommendation is to cede the management of the existing four refineries for a period of two years to competent expatriate firms as inferred by NRSTF report. Ceding the management will help in three critical ways. The most compelling is that the two-year period will offer the opportunity to retrain the workers and sanitize the entire maintenance culture within the refinery towards efficient delivery. Very expediently, it will minimize the chances of refinery agents colluding with oil marketers to perfect backhand practices induced by the subsidy scheme. Furthermore, such approach has the potential to assuage the concerns of past bidders under Turn Around Maintenance (TAM) of NNPC—who were unwilling to guarantee repairs because of a suspicion of sabotage within Nigerian refineries. Besides, with an anti-corruption democracy soon to be in place, it is expected that the original builders of the refineries (who had declined to participate in the past) will now show interest. A competent refinery management team can build on the snail progress under TAM to boost production within 6 months of undertaking. The third recommendation is to deploy without further delay new wholly state-owned easy-to-install modular refineries. Similar to the modular initiative of 2012 by the Trade Ministry, the refineries should be spread to strategic parts of the country. The difference is that this current proposal calls for eight refineries; and, importantly, the contracts should be awarded to eight different companies. Further, the location template should be the existing national crude pipeline-depots network. Ideal cities are Calabar, Enugu , Lagos , Ibadan , Suleja, Kano , Gusau, Jos, and Maiduiguri. Fourth, Nigeria should consider proven modern pipeline monitoring systems to gradually disengage militants from guarding the nation’s pipelines. The pipeline to national economy cannot be at the mercy of a cabal, whose only claim to authority is a history of conspiracy, blackmail, and using innocent youths to sabotage strategic national interests. Fifth, the government should adopt a cautious approach to deregulation and local content laws in the downstream sector. While such bold initiatives remain a potent ingredient for national development, implementation without decisive change in Nigeria ’s current socio-economic culture is an exercise in futility and a threat to national security. The point is that the new government should first strive to create the enabling environment by adopting, among other measures, the recommendations enumerated above. In the same token, there is the need to lessen bureaucratic bottlenecks and offer the desired assistance as well as incentives to private refinery projects already in progress. Effective implementation will not only accelerate the engine of deregulation and the attainment of efficient local workforce in the downstream sector, it will also engender sufficient supply of petroleum products and a fair and stable price regime. Finally, given that Nigeria cannot at the moment boast of trusted, “competent and experienced” local firms to build and efficiently manage her refineries, and in view of the fact that expatriates come in different shades, the incoming government must also exercise caution in selecting contractors to vital projects. Nigeria must desist from the prevailing pattern of engaging firms from dubious cultures who grandstand as experts but in true sense are worse than the natives themselves. By Dr. SKC Ogbonnia, Chairman, First Texas Energy Corporation.